to seamlessly tie into the grid, and the first live connection of a grid-scale flywheel energy storage system is now operating in New York State. 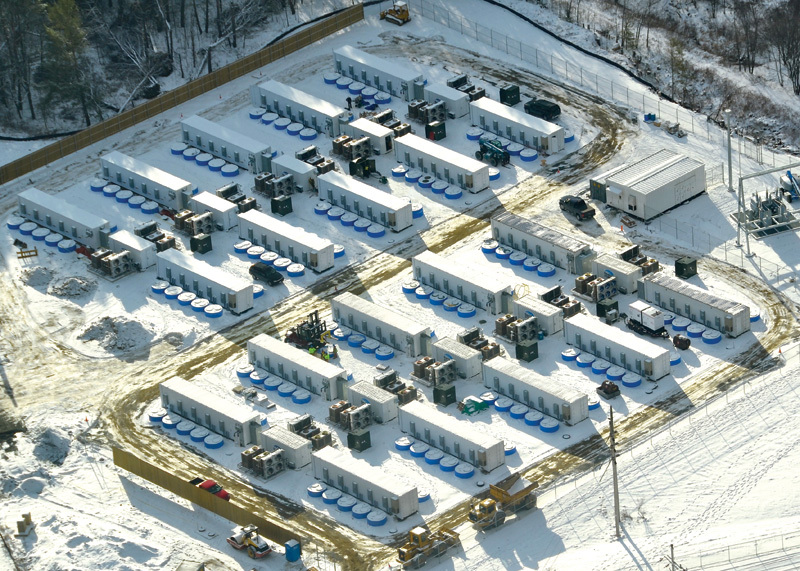 Beacon Power's technology has been approved for use on five of the six power grids in the United States, and the first live connection of a grid-scale flywheel energy storage system is now operating at a frequency regulation plant in Stephentown, New York. The consistent supply of electricity is like a high wire balancing act between supply and demand. A greater influx of power from renewable sources to power grids can disrupt that balance. However, along with new, economical ways to generate renewable power, new tools are being invented to seamlessly connect the producer with the consumer. Corporation may prove invaluable for plugging renewable power sources into the grid as well as providing a stronger safety net for consistent, reliable power to consumers. It's called a flywheel energy storage system, and it has the ability to convert electrical energy to kinetic energy and back to electrical energy in a matter of seconds, without the use of fossil fuels. Its main purpose is to provide power grid frequency stability in a more responsive, cheaper, and environmentally friendly way than is currently provided by power plants. The technology hinges on a fairly straightforward scientific principle known as the first law of thermodynamics, which states that energy can neither be created nor destroyed but can only be converted from one form to another. This is exactly what the Beacon Power flywheel does as electricity demand fluctuates. Each of Beacon Power's Smart Energy 25 flywheels is a vertical cylinder measuring about seven feet high and weighing about 8500 lbs. It consists of a high performance rotor assembly that is sealed in a vacuum chamber, which spins at between 8,000 and 16,000 rpm. At 16,000 rpm, the flywheel can store and deliver 25 kilowatt hours of extractable energy. The rotor is enclosed in a vacuum to reduce friction and energy losses. To reduce losses even further, the rotor is levitated with a combination of permanent magnets and an electromagnetic bearing. 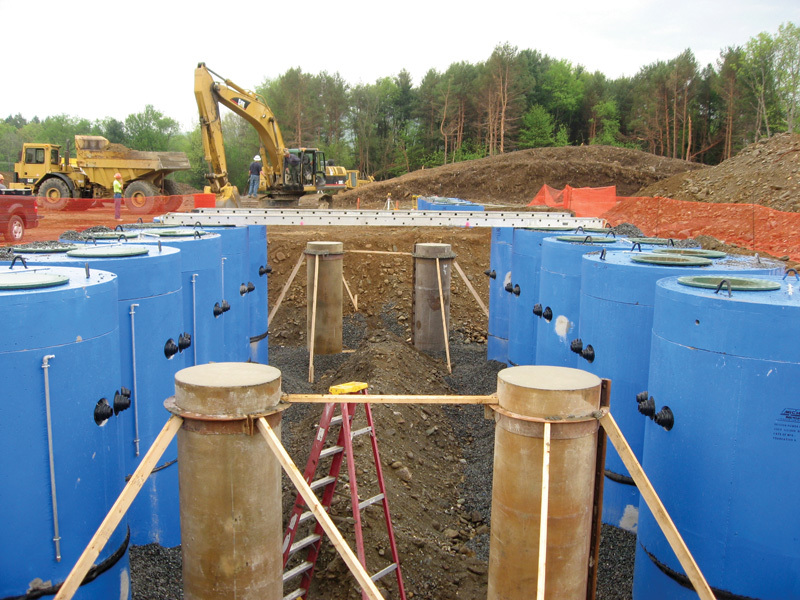 The units can be interconnected to multiply storage capacity and are installed below ground in a concrete housing. Each of Beacon Power's flywheels is a vertical cylinder measuring about seven feet high and weighing about 8500 lbs. It consists of a high performance rotor assembly that is sealed in a vacuum chamber, which spins at between 8,000 and 16,000 rpm. At 16,000 rpm, the flywheel can store and deliver 25 kilowatt hours of extractable energy. Beacon Power holds over 60 U.S. patents involving its technology and about a dozen international patents. It's also the only player offering this flywheel technology at a grid application level. "It's based on a straightforward principle that's as old as an ancient potter's wheel," says Gene Hunt, Beacon Power's director of corporate communications. "What makes this different is the use of technologically advanced components that did not exist 10 years ago." Among these are carbon-fiber composite materials, advanced semiconductors and other electronics, hybrid magnetic bearings, and motor-generator designs that allow for extremely fast response to control signals with high efficiency. It has taken some time for Beacon Power to develop its technology to its current level. The company was founded in 1997 with the goal of developing advanced flywheel-based energy storage technology. Its first and second generation systems were deployed in North America for back-up power in the telecommunications industry. However, as that market slowed and with positive feedback from both the U.S. Department of Energy as well as the PJM Interconnection (one of the largest grid operators in the world), Beacon Power redirected its research and development program to develop a new generation of flywheel products aimed at "recycling" electricity from the grid to perform an essential grid stabilization service. While consumers perceive a steady stream of electricity, the reality is that power supply and demand are fluctuating all the time, with peak demand generally occurring during the day and lowest demand when people are asleep. The public is largely unaware that there are a number of stabilizing services that are needed to ensure a constant electrical balance on each power grid at a stable 60 hertz (Hz) or cycles-per-second frequency. That balance is maintained by signals sent by grid operators like PJM Interconnection to power generators to maintain, boost, or decrease power supply based on supply and demand. Current energy storage systems can take up to five minutes to respond to a signal from grid operators to boost or reduce power production. The Beacon Power flywheel has captured the attention of both the conventional and renewable power generation and distribution community because of its ability to absorb or discharge power for as long as 15 minutes and to respond to the grid operator's control signal in under four seconds. The technology has been approved for use on five of the six power grids in the United States, and the first live connection of a grid-scale flywheel energy storage system is now operating at a frequency regulation plant in Stephentown, New York. 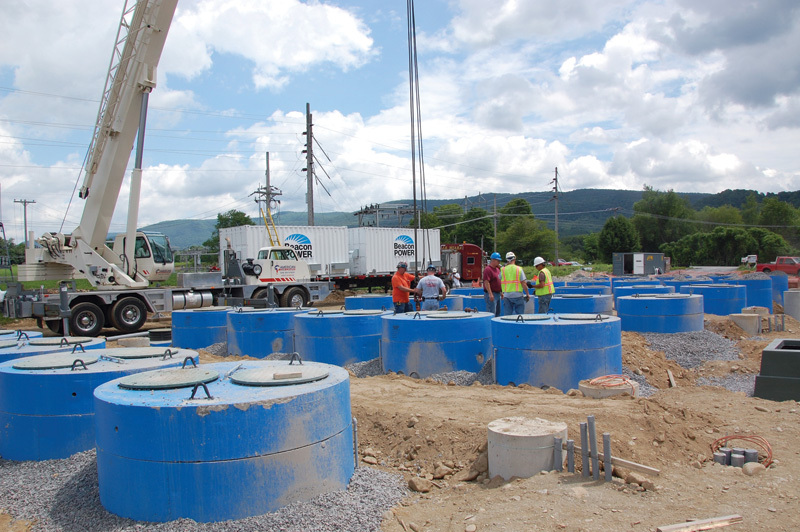 This first installation, which is providing 14 megawatts of flywheel energy storage cost about $69 million to build. A second frequency regulation plant that Beacon Power is planning to build into the PJM grid is expected to come in at about $52 million, and the cost for a third installation is expected to fall even lower. At full capacity, Beacon Power's Stephentown plant will provide 20 megawatts of regulation service to the New York power grid, or approximately 10 percent of the state's typical daily demand. At full capacity, Beacon Power's Stephentown plant will provide 20 megawatts of regulation service to the New York power grid, or approximately 10 percent of the state's typical daily demand. The New York grid is controlled by the New York Independent System Operator (NYISO), and it sends out signals to absorb or inject power every six seconds. The Beacon Power installation at local utility provider, NYSEG's substation in Stephentown is now one of the resources it calls upon to balance supply and demand. Beacon Power earns revenue from the use of its installation, and revenue will increase as the installation ramps up to its full 20 megawatt regulation service capability. That was expected to be by May. By connecting 10 of its Smart Energy 25 (Gen 4) flywheel energy storage units, Beacon Power is able to generate one megawatt of power. So at 20 megawatts, the Stephentown facility will eventually consist of 200 units. "Fossil fuel plants can take up to five minutes to respond to a signal, meaning that by the time such a conventional resource has fully responded to a particular up or down signal, another 50 control signals could have been sent," says Hunt. "This means that fossil fuel plants, bulky and slow moving as they are, will sometimes find themselves actually going in the opposite direction of where the grid operator wants them to." While the Beacon Power flywheel technology is not a long-term solution for power storage for alternative technologies such as wind and solar, it could be the gateway for renewable energy producers to seamlessly tie into the grid. Hunt says that as more intermittent generation resources are added to the grid, there will be greater and more frequent imbalances between demand and supply, which needs to be constant at a tightly regulated 60 hertz and can be forecast and controlled in today's power generation environment. However, he adds that maintaining a supply and demand balance will become less predictable when renewables reach 10 percent or 20 percent penetration. "With greater imbalances between supply and demand, there will be a doubling or even tripling in the need for regulation. That's where our technology can play a role—providing fast-responding regulation capacity at high efficiency without emissions or fuel consumption." Beacon Power's first installation in New York State, which is providing 14 megawatts of flywheel energy storage, cost about $69 million to build. 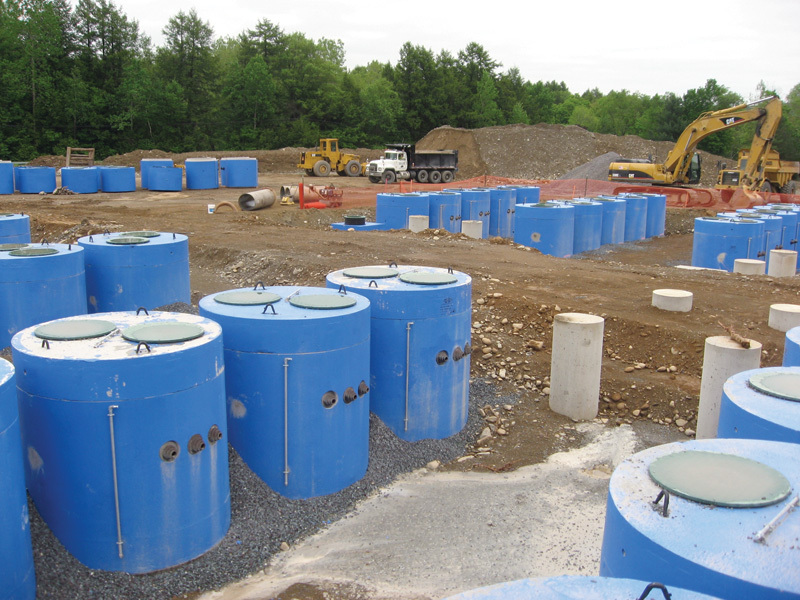 Subsequent plants are expected to come in at a reduced cost. That ability to stabilize renewable power flow to the grid is already being demonstrated in California, which has set a target of achieving 33 percent power production from renewable resources by 2020. Beacon Power has installed a flywheel energy storage system demonstration project at a wind farm in Tehachapi, California, in collaboration with the California Energy Commission, California ISO, and power utility PG&E. The application of the technology is somewhat different than the New York installation, which was focused on frequency regulation. The concept in California is to demonstrate how the flywheel can be used as a safety valve between local sub-station lines and wind power producers. In this situation, ‘intelligent agent' controls are used to demonstrate how it is possible to enable as much wind-generated electricity to be delivered as possible without exceeding the limits of the locally constrained transmission system. At times when the local sub-transmission line is constrained because of a lack of delivered power or thermal overload, the intelligent agents (provided by a company called Alternative Energy Systems Consulting working with Beacon Power) will override its regulation function and order the flywheel to operate temporarily as a full-scale commercial system. It would return to its frequency regulation role once the constraint is resolved. The goal is to demonstrate that this flywheel system can deliver value to the grid operator in addition to frequency regulation. The Tehachapi area of California has been identified as a high potential wind resource by the California ISO, with as much as 4200 megawatts of wind power possibly being added in coming years. "This was the first Gen 4 flywheel that we shipped, installed, and operated outside of Beacon's facility, and it went very smoothly," says company president and CEO, Bill Capp. "It's also the first of our systems intended to show how energy storage can help to optimize the output of a wind farm." for selling turnkey implementation of its technology are power companies that provide both conventional and renewable power in the closed, or vertically integrated, electricity markets in North America and abroad.